The majority of pharmaceutical products fall into a category which states ‘do not store above 25°C’, ensuring that pharmaceutical products are kept at a precise temperature is essential during EcoCoolings design phase. The below installation scheme incorporates cooling, heating and destratification. The system includes hot air recirculation which means that a consistent supply temperature can be achieved all year round. The ECP range of coolers are also available in side and top discharge models to allow for variances in installation techniques (i.e. if they cannot be placed on the roof). For more details on possible installation techniques please contact EcoCooling directly. 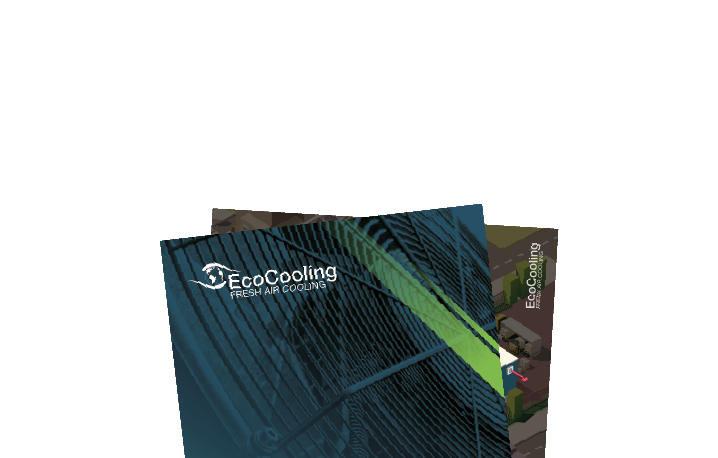 EcoCooling systems use Electrically Commutated (EC) fans which are the most efficient available. Further efficiency is gained by speed control. Operating the EcoCooling system at half speed reduces the fan energy use by over 85%. The EcoCooling evaporative cooler maintains hygienic operation and fully complies with all legionella control regulations by applying the following principles: Avoidance of droplets; Low water operating temperature; Avoidance of stagnant water; Avoidance of corrosion and scaling; Regular maintenance. The system is controlled using slave PLCs and a central HMI touch screen for fully automatic control of heating and cooling in single spaces or zoned warehouses. The latest control systems can include network communications, data and event logging, secure remote access, optional email notifications and online MKT graphical analysis.